Posted by Mr. Tea Rose Home on behalf of Mrs. Tea Rose Home. Hi everyone! I know I usually update my post on Fridays. Today's post is a little boring, so bear it with me. I went in to the hospital to get a procedure done this morning. Even though I'm home, I can't do much right now. For those of you who are new to this blog you might be wondering, "What procedure?".... No I didn't get plastic surgery or anything like that to improve future pictures of me. If you want to find out go here, it will explain a little of my condition. The procedure is pretty routine for me, so I am OK. Besides, Mr. Tea Rose Home is taking good care of me. I should be able get up and resume my regular schedule sometime next week. Meanwhile, It is the perfect time for me to catch up on my reading and I might be having a breakfast in bed. So I can't complain. So Everyone, Have a nice weekend and see you all next week! Mr. Tea Rose Home: Well that's it folks, I guess I have to try and figure out what to do for breakfast. "Honey! Where do you keep the milk!?" Before I show you this tutorial, let me talk about myself and clothing a little bit. As I mentioned before, I like clothes. In fact, I like so many different styles that it is hard for me to say, "this is my style". Although there is one thing I have noticed about myself and that is after I experiment with many differnt stlyes, I always go back to the classic feminine stlye. There is a reason why. I was in Junior high at that time, It was one late night. I could not go to sleep. (I was a night owl back then too). I decided to watch TV for a little bit and flipping through the channels, I found an old Movie. The actress was so beautiful and the clothing she wore in the movie was so classy and captivating. Later I found out that the actress was Audrey Hepburn, and the movie was called "Breakfast in Tiffany's"... After that I watched "Roman Holiday", "My Fair Lady", "Sabrina", and "Charade". A few years ago on Valentine's day, my husband got me a bunch of Abdrey's DVD's! I love how she carried herself (always with a great posture and smile) in those movies, and the clothes she wore had class. Not too revealing, yet very feminine. I must say, whenever I watch her movies, they are always fresh and inspiring. I never get tired of them. To me, Audry and the clothes she wore will never go out of style. But, hey, do I live life like that? Hmmm...maybe not, first of all, where am I going to wear it? I can't cook, clean and drive around like a maniac (sometimes) to school, to after school activities, to the groceries, etc. I should get something more real for now. For those who read looong intro, THANK YOU! Ok, I will show you what I did. 2. I found the knit fabric in Joann's clearance section. It is a little darker than the sweater, but it goes well together. Cut 2 pieces of 2" x whatever the length of the edges of the sweater. Fold the strips in half, so you will know the center of the fabric. Cover the edges, pin them and sew. 3. Measure the length of the front openings and around the neck. Add those numbers to figure out how long you will need the strip to be to make ruffles. I recommend to have at least 2-3 times its length. Cut, 2-3 pieces of 2" wide x width of the fabrics strips to make ruffles. Piece the strips together and make a long strip. 5. Pin the finished ruffles all around the edge. 6. 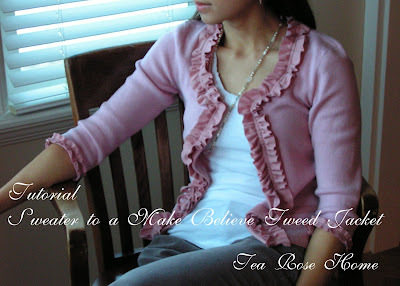 Sew the ruffle on both sides of the big stitches. It is ideal to sew 1/8" next to the line. So, both sides combined, it will be 1/4" wide. Pull out the middle stitch from the ruffle. After this you can say you are done. If you want to add more details to the sweater, keep reading. I got carried away and decided to stitch and make my own button. You can buy button making kits at Joann's, or, you can buy button. Also, I cut 1" x 8" fabric and made a rope to close the button. I also added a fake pocket opening to each side. 1. Iron a strip of interfacing in the back of the area you want the fake pocket. 2. Pin a fabric(1" X 4") in front (make sure that it is on top of the interfacing). 4. Fold the top half to the bottom edge, pin and sew the sides and the bottom. 1. Measure the circumference of the sleeve opening. Cut 1" x (whatever the lengh of the opening X 2 or 3) to make the ruffles for the sleeves. 2. Pin it, and sew. I must say that it was a little tricky since the opening is so small, but if you do it slowly you should be fine. My Jacket is not quite like Audrey's but I like how it turned out. It is pink and ruffley, I like to pair it with jeans or cargo pants so it won't be overly feminine. It is very flexible and comfortable, since it was a sweater before. Perfect for someone like me... I will take baby steps on the path to become like Audrey. I blogged about some baking molds I found at a thrift store about a month ago. I used the molds and made a dessert for my family. I have to admit, that, I tend to do more when we invite our friends over and entertain. Cleaner and neater home, prettier setting on the table and perhaps prettier dessert too. I thought why not do a special dessert just for our family. I want them to know that they are very special to me. They loved the desserts, and we had a fun night. Note: The new tutorial I have been working on is coming up on Wednesday be sure to come back and check it out! Do you rember this post? It was a long time ago that I gave my bedroom a facelift. It took me a while to decide what to do next, not to mention a while to come across something I love. I found this mirror at Ross for $29. I know it is a lot more than the $1 or $2 I spend at my usual thrift stores, but hey, I thought it was worth it. and... there was a dilemma. I wanted to use my cricut machine to cut out some vinyl designs to put on the mirror. I just couldn't... If you know me well, I am terrified of trying out new technology. I am just that way. My husband says I am not real Japanese, oh yeah, all Japanese should be tech savvy right? I am afraid that I will do something dumb and break it. One of my kind friends came over and helped me figure out how to cut out vinyl last Monday, Thank you! I was finally able to finish up the mirror. I finally made some progress on my bedroom facelift. At this rate, who knows when I will post more of the bedroom make over. It could be another year or so. I liked the mirror so much that I kept staring at it while I was folding the laundry. Because every time when I passed by the unfinished mirror I felt bad, finishing this project totally made my day. Are you all so anxious to find out what else I found at a thrift store? I am so excited to share what I found and their small transformations! Display Rack! This is another item that my husband said, "What the... They really sell everything". I have been wanting one of these for my work space for a while. All I can say is "Ask and you shall receive." Oh, just incase you are wondering how much I paid for this, it was $5. I pulled out some of my fat quaters and played "display". The next item... I found two separate items and transformed them to one. I love it. Now I have a beautiful candle holder, I might start planning to do a "Romantic Valentine's Dinner for Two". We don't have to go out, I could put the kiddies to bed at 6:00. Hehehehe... Although, for some reason when I try to be romantic and seductive I always end up doing something silly. It becomes a love COMEDY! So, maybe not. This post is about the item I found at a thrift store and a short story to go with it. I always wanted to use a ladder to decorate my house. Many places sell them and the ones I saw were anywhere from $30 to over $100. I found this one for $2!! I came home and washed it, disenfected it, and just left it next to the fireplace. I had dinner to cook, so I just left it there. My hubby came home... I wasn't going to say anything, I was wondering how long it would take for him to notice there is a ladder in our living room. To my surprise, immediately "What a...! Why's there a ladder in our living room?" "Gosh they sell everything there. What do you need a ladder for? Where is it going to? You better not have paid more then $2." Let me tell you ladies, since you can't see us or hear the tone of his voice when he said this. He is not being mean or bossy, that is how he teases me. I said "That is just amazing!! How did you know that I paid exactly $2 for it!" He said "Well, I know you. So, what are you going to do with this?" Remember, I was cooking, so I was facing the stove when we were having this conversation. I said,"I am going to use it for decoration. You know you can put magazines, or quilts..."
Then, my 9 year old who was doing his homework at the kitchen table said, "Mom, he is rolling his eyes!" "No, I didn't! He is lying!" I gave him a quick crusty look and went on cooking. I was so excited to find this, and it is already white, I don't have to do anything. Since I haven't quite figured out where to put it, it will be next to the cabinet for now. Hang on tight, I have more "finds" to post later this week! Do you have great finds you are excited about?